While the latest smart phones may be the focus of attention at Mobile World Congress 2016, some of the most interesting tech gadgets that will be unveiled to the world aren’t yet considered to be part of the mainstream. Take IOFIT, for example. Technically considered a wearable device, this unique smart shoe is in a category of its own. 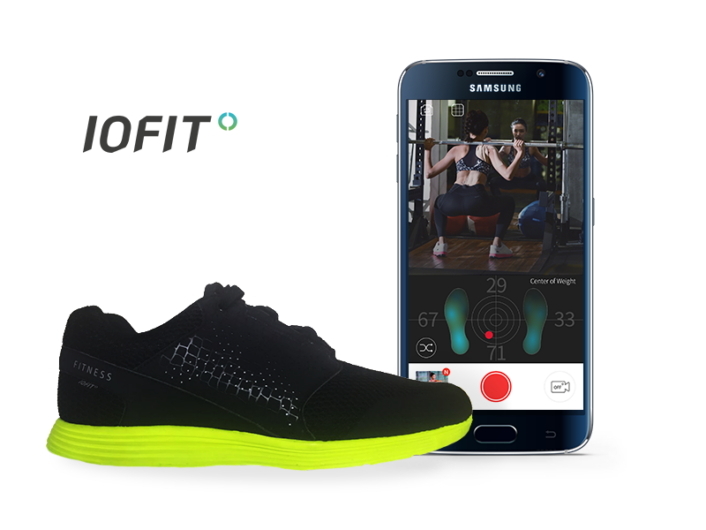 Developed by Salted Venture, a startup supported by Samsung Electronics, IOFIT is a solution that utilizes a combination of pressure sensors and a coaching app to improve a user’s balance and body posture to enhance one’s fitness routine or golf swing. 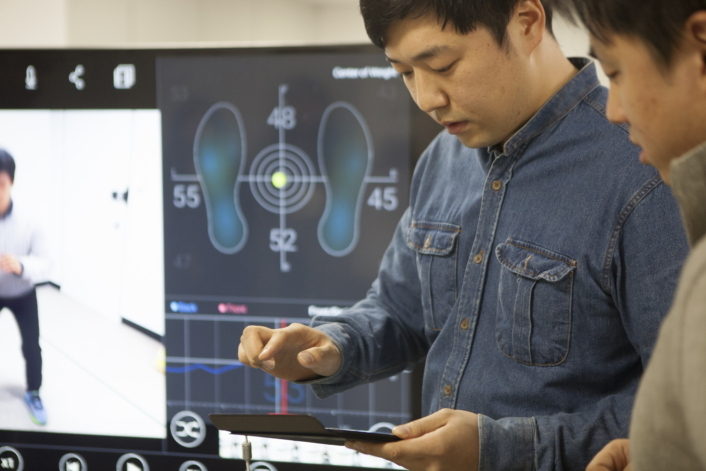 The idea for the smart shoe was born at C-Lab, one of Samsung’s primary Innovation Programs that helps its employees to nurture creative business ideas. Soon thereafter, the team left the firm to establish Salted Venture as an independent company and create new business opportunities. After realizing the possibilities and potential applications of the information coming from feet—possibilities that range from healthcare initiatives to video games—the minds behind IOFIT realized that they needed to segment their customer group to a more specific target to provide the most value. That’s when their extensive field research began. While visiting premium fitness centers and professional golf facilities, the team learned how force plates—equipment used for posture rehabilitation and data analysis—proved the value of their idea. “There was an existing solution that was providing value already,” said COO and UX Planner Sehee Lee. “That’s what validated our belief in how this product can provide value for people.” Unlike the static, pricey equipment, however, the IOFIT shoe would need to be portable and cost-effective. To do this, data analysis technology like accelerometers and pressure sensors were incorporated into the outsoles of shoes. Together, they are able to measure users’ balance, weight shift, ground contact force and location of COG (Center of Gravity)—specific factors essential to enable a more efficient and injury-free fitness and golf experience. 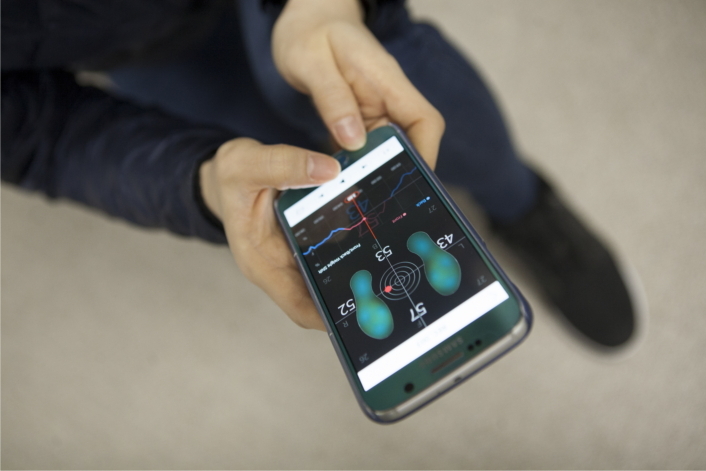 This data, updated in real-time, is displayed on a pressure map on the screen of the IOFIT smartphone app, which pairs to the shoes. “The technology is not only portable, but also seamless. It’s integrated into something you wear all the time, so you don’t even have to think about it,” noted Marketer Jungsoo Park. As wearable device users, the creators behind IOFIT recognized the limitations of wearables such as smartwatches, fitness trackers and even other smart shoes currently available on the market. As such, it didn’t take long for IOFIT to become centered specifically on coaching. Instead of simply offering users a compilation of data, the Salted Venture team developed a system that allows for an enhanced person-to-person connection. What makes this possible is the video playback feature of the IOFIT application, which allows a user to evaluate their form and the respective real-time data all on one screen. 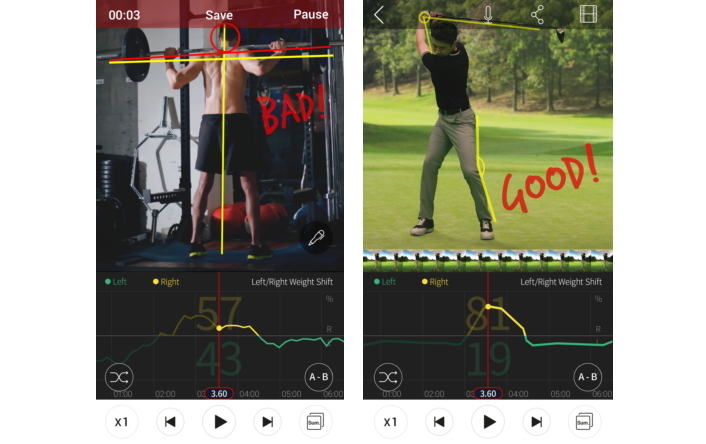 Utilizing this core feature, a user can better visualize how they look, and how their stance and posture are affecting their fitness routine or their golf swing. Another core feature of the application is the customizable coaching and analysis software which can be used to leave feedback or compare saved videos. With this tool, a coach can draw directly on the video or leave voice-over comments to offer precise, straightforward feedback. Furthermore, two videos can be compared side-by-side or stacked to give a clearer picture of what the data should or should not look like, allowing trainers to easily coach no matter their location in the world. “We want to be a platform and a coaching tool for people to use. It’s an add-on to the interactive experience between people,” stated Lee. “You can’t outweigh the benefits that come from a real human-to-human interactive experience.” In this way, IOFIT remains unique in an ever-growing wearables market. While functionality is indeed an important factor, the footwear industry is also about style, which is why Salted Venture is focusing many of their efforts on the design of IOFIT. “We don’t want people to just buy our shoes for functionality. We also want them to feel proud when they wear our shoes in public,” said Park. As such, the startup is actively seeking business opportunities with footwear companies, and has already garnered attention from some of the world’s biggest brands. The group hopes to reach out to other shoe brands that share their vision during Mobile World Congress later this month in Barcelona, where they will be participating as an exhibitor. Salted Venture is also excited to showcase IOFIT on a global level and get feedback on their product. Be sure to check out IOFIT at MWC from February 22 to February 26, 2016. IOFIT will be showcased at Stand 8.0K5 in Hall 8.0 of Fira Gran Via. To watch IOFIT demonstration, check out the video below.